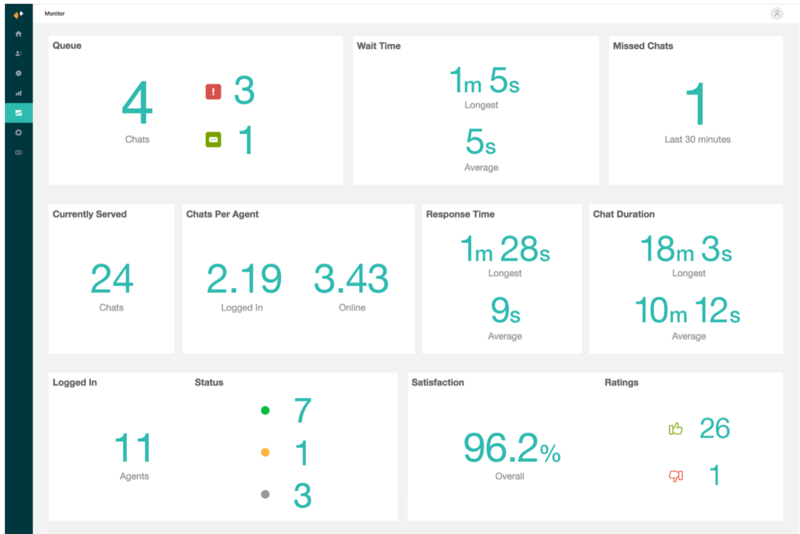 With Monitor, see an overview of key chat metrics, including queue size, customer wait times, and chat satisfaction, on a single screen. Customer service team leads and agents can get an at-a-glance view of current chat support demand and update agent assignments accordingly. Queue Chats : New chats that have not been served by any agent. This is the sum of Incoming Chats and Assigned Chats. Applicable only if chat routing mode is set to Assigned. Incoming Chats: New chats that have not yet been assigned to an agent. Assigned Chats : New chats that have been assigned, but not yet served by an agent. Applicable only if chat routing mode is set to Assigned. Wait Time (Average and Longest): The average and longest times visitors have been waiting for their chats to be served. Wait time is calculated as duration between the first visitor message in the chat and the first agent message. Wait time will be 0 for agent initiated or trigger initiated chats. Chats Missed (Last 30 minutes): The number of chats where the agent does not answer the incoming chat and the visitor subsequently leaves for the past 30 minutes. Response Time (Average and Longest): Average and longest time that visitors have been waiting for an agent reply. Response time is calculated as duration between first unresponded message by a visitor and next agent response. Chat Duration (Average and Longest): The average and longest length a current ongoing chat. Chat duration is calculated as duration between first message in the chat (visitor message, agent message or message sent via triggers) and when the chat ends (visitor ends the chat, or last agent leaves the chat, or chat ends due to inactivity timeout). Invisible Agents : The number of logged in agents with their status currently set to Invisible. Admins can customize which of these statistics appear in Monitor for the whole account. In the dashboard, select Monitor. Select or clear check boxes next to each statistic to determine if it appears in Monitor. Both agents and admins viewing the dashboard can filter the statistics by department. Select one or more individual departments, All Departments, or No Department. Click the Filter by Department drop-down menu. Select All Departments, No Department, or an individual department. Get additional insight into your team's acitvity using the Real-Time Chat API. For details, see our API documentation. It'd be great if the total number of chats served and missed for the current day is shown here. Feature request to add the current running daily totals for Average Response Time and Average Wait Time Served. Where is Service Level? The most important call centre metric?